Healthcare skills and training are always in demand, and as a nurse aide, you’ll have the opportunity to apply for employment in a variety of settings with patients to care for and attend to. You’ll maintain patient hygiene, support doctors and nurses, and assist in patient charting. You can work in home health care, long-term care facilities, hospitals, and more under the supervision of a nurse. Excel Training Institute offers a 120-hour Nurse Aide/Home Health Aide training program for individuals looking to enter or further their healthcare careers. 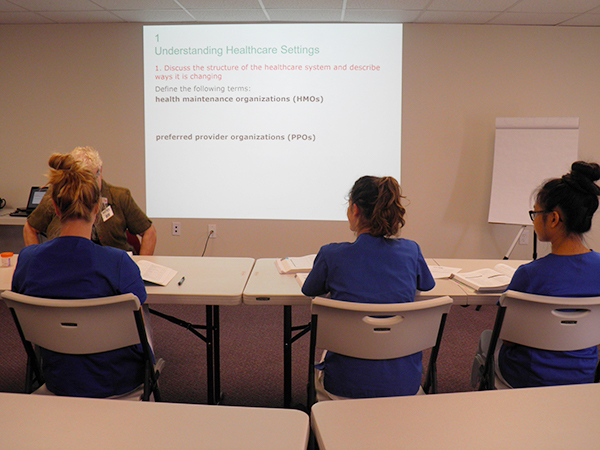 Our Nurse Aide Training program provides quality classroom, lab and clinical setting training to our students. Upon satisfactory completion of our course, our students qualify to take the Massachusetts State Competency Test to become a Certified Nursing Assistant (CNA). You’ll be trained by Registered Nurses and Licensed Practical Nurses with extensive experience in both clinical and educational healthcare settings, short and long-term care, home care, and residential healthcare settings. Our staff takes pride in utilizing a team approach in education delivery and assisting students to achieve their educational goals. Excel Training Institute’s course will introduce the necessary student learning competencies required by the state of Massachusetts and prepare students for taking the Nurse Aide State Competency Exam. In addition, you will receive a Certificate of Completion for Home Health Aide Training. To ensure personalized instruction, we keep our class sizes small. Each Registered Nurse Instructor will never have more than 10 students assigned in the clinical setting. Classroom/clinical laboratory: Lectures, videos, power point and hands-on demonstrations are the central focus of learning. Quizzes and skill proficiencies will be evaluation methods for determining learning. Clinical experience: Students are placed in facilities and work directly with residents under supervision of a Registered Nurse. Through both components of our Nurse Aide Training course, you’ll get the knowledge, skills, and training necessary to work as a Nurse Aide or Home Health Aide in Massachusetts. It’s our goal to develop a qualified, compassionate, and dependable workforce through our curriculum. We’ve established relationships within the community with area hospitals, nursing homes, home health agencies, assisted living facilities and schools to better assist you with placement opportunities upon training completion. Our training facility is located in Wilbraham, MA on the Indian Orchard, Wilbraham, and Ludlow town lines with ample off-street parking and bus route access. We also have a training facility in Pittsfield, MA. For more information about registration and our nurse aide training classes, call us at 413-583-8900 or email us at training@excelnursingservices.com.